My first new pro skateboard was one of the best things I ever bought. 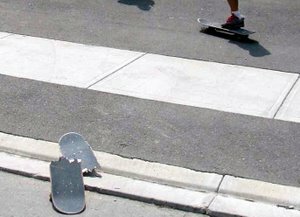 My first broken skateboard deck was what made me want to work for money. I never thought about money until I needed to skateboard. The hunger to skate was so powerful it has driven much of my working life. While all parts of the skateboard can break. It is the wooden deck that is most likely to snap. Replacing a worn out or broken skateboard deck is one of the best part of getting a new board. That is because your trucks, wheels and shoes are all worked in just right and then you get a new fresh deck. It has lots of grip and nice round nose and tail for lots of crispy pop. Great for popping all your best tricks higher and cleaner. When I had my first pro skateboard I did something dumb when I was mad. I focused the skateboard. Focusing a board is when you break it. Delibrately or by accident. It can happen when you get unusually mad and it is not a pretty site. it is kind of dumb actually. I did it and the board was now cracked through the bottom plys and I didn’t want it to break any more. It was my only skateboard and without it I would not have much to do for fun. I felt dumb for doing it. I couldn’t get a new board so I got crazy glue and popsicle sticks and glued them on the bottom as a patch. It worked alright. I had a board to skate and I was okay. Some other skaters made fun of me and bothered me a lot about it. They bothered me enough that I got mad and then did break the board right through. That was one of the dumbest things I could have done. Now I had nothing to skate and no way to get a new skateboard. The first time I had a broken deck was the first time in my life that I needed money. I had to get money to get another skateboard. I didn’t know much about getting money at that point. I never thought about it because I didn’t feel like I ever needed things. When I wasn’t able to skateboard that was all I could think about. I did chores around the house and cut my aunts grass. I tried to save up and do it quick! Once I had the money I needed a ride to the skate shop. It was an hour away by car. In the present you can get skateboard from a lot more places. More shops and online stores give you many options. Even with all of these places to buy a board, as a kid $100 can be hard to come by. So be careful with the skateboard you have. Nothing kills a session like a broken board. There are a few ways to avoid breaking your board. Some are a trade off in what you will skate but they keep you rolling longer. I don't do lipslides very much. The motion of landing on the rail can cause lots of breaks and snaps. I stay away. I don't do big drops or stairs. The higher the drop the more likely you are to break your board. I bail on tricks sometimes to save from a snapped deck. Even if I could have landed the trick. I would rather miss a few extra times then smash through a good board. These rules have limited the types of tricks I do but that is the price I pay to avoid a break and keep skating. Snapping your board for fun! As much as I try to avoid a broken skateboard, sometimes you just gotta do it. The sound that it make when you snap through is awesome. If you do it while trying a trick all the better. That means its time to demolish the thing. When it has a crack or is really damaged and I have another new deck in the waiting. It is hard to resist. If you snap one part then have some fun and break through the other two. The crack! sound is great and it feels good to push your feet through the board. Sometimes it won't snap even if you jump on it really hard. This may hurt your feet, make you fall all over the place and even look like an idiot. Trust me its fun enough and worth it. You're not a skater until you have focused your board. Turns out that artists that have come up with creative ideas for what to do with the old broken parts. These are pretty cool. Some turn the bits into fashion accessories for women and others make furniture out of them. The products they create are totally cool looking with all of the colours and scratched and charater of the old broken skateboard but in a new useful way. I love it! More on that soon.